I think I may have finally made a decision on my endless packaging dilemma. I have been reading about how, as a jeweller, how you present yourself and your brand is super-important, which is something I've been giving more thought to as I've been messing about with my website. I've been looking at some quite nice pink and black boxes, but when it came down to investing in logo printing on them, I just couldn't quite commit, as I wasn't 100% happy with them. After much dithering, I decided I was going to get some custom made leather boxes, but after pricing it all up, it was just way too expensive and I couldn't quite justify the cost. 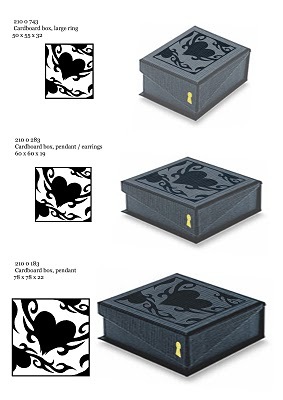 Some more dithering has finally brought me to the idea of having the design I use for the background of my banner and website foil printed in high gloss black onto a matte black box, with a little gold keyhole printed on the front of the box.